Remove bracket support for vacuum line left of brake booster. Remove plastic knee panel and support under steering wheel. 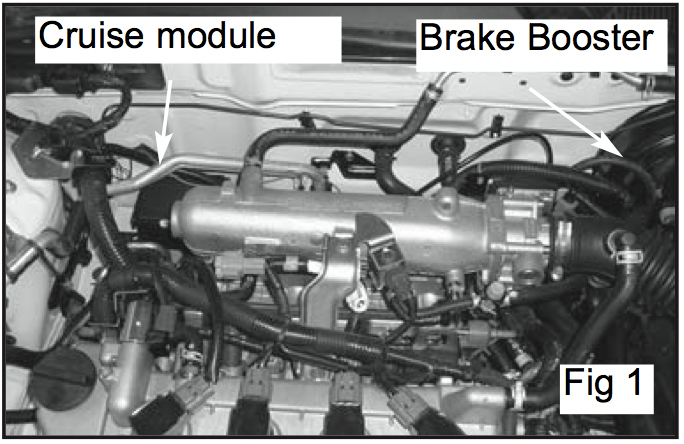 Mount cruise module on passenger side (Figure 1). Thread end of module cable and install snap-in square adapter where you have 1 3/8 inch of cable past the end of the snap-in connector. Design "L" shaped bracket (Figure 2). Mount "L" shaped bracket to studs (2) on bulkhead left of brake booster. The second hole from top of "L" shaped bracket will go to top stud on firewall (Figure 3). Mark the center of square hole on bulkhead. Remove cable support bracket and drill 3/8 inch hole through bulkhead. Install snap-in adapter into square hole in cable bracket. Guide cable through 3/8 inch hole on firewall and secure with (2) self threading bolts to bulkhead. 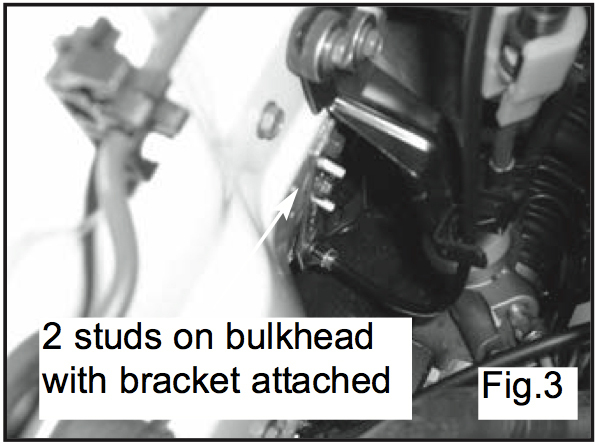 Angle on bracket toward front of vehicle. Inside the vehicle, put the connector cover and eyelet connector on the end of the cable. Pull the cable to the gas pedal and drill a 1/4 inch hole through the plastic gas pedal. Use screw, round head (#10-32x.5) from passenger side to drivers side of gas pedal, secure with lock washer nut. Pull eyelet connector to screw mounted through gas pedal and make throttle connection. Use second lock washer nut to secure eyelet to pedal. 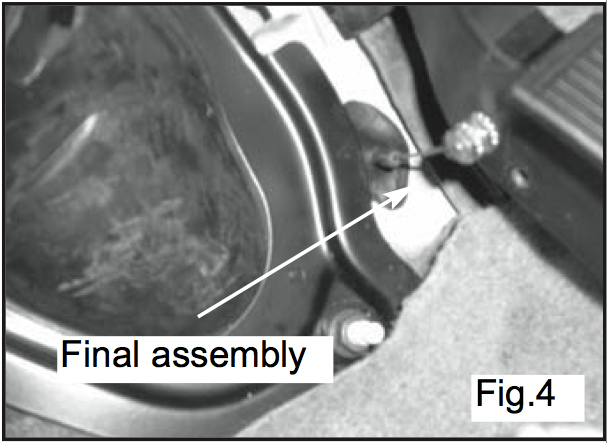 Final assembly (Figure 4). Re-assemble steps 1, 2, and 3. NOTE: The cable must be mounted in a manner that the pull is straight back. No angle between connection on gas pedal and cruise cable. VSS: Right rear of transmission top side 2 pin connector. Red/Yellow 8000 PPM. Hot Brake Red/Yellow. Cold Brake Red/Green. Please note, Rostra cruise control systems are only sold through authorized distributors. Please contact Rostra to locate a distributor in your area for your 2003-2006 Nissan Sentra cruise control needs.